Visiting US academic Dr Suzanne Pierce believes environmental decision-making is shifting away from government agencies towards a combination of science and community values. In a special presentation as part of ICE WaRM’s Visits and Exchanges Programme, the professor from the University of Texas said traditionally water resources were controlled by governing agencies, which developed plans based on analytical information provided by scientists and engineers. But now, she sees economic, social and political considerations emerging as the driving forces for groundwater resource management.Dr Pierce, who’s Research Assistant Professor with the Center for International Energy and Environmental Policy at the Jackson School of Geosciences, believes decision-making can be improved by incorporating a mix of social concerns and computer-based models for groundwater. Dr Pierce is a hydro-geologist who focuses on trans-disciplinary approaches. Her research integrates earth resource problems with decision-making processes to generate transparent and adaptable water management policies. 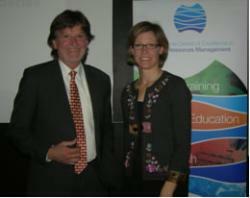 Her ICE WaRM-sponsored stay in Australia was hosted by the National Centre for Groundwater Research and Training, Flinders University and the Australian National University.